The average viewer of Russian television has long had the impression that Russia no longer has any links to Ukraine — whether in terms of transport connections (direct flights are suspended), economic ties (there is a two-way food embargo) or culture (Ukrainian TV allegedly doesn’t broadcast Russian films, Russian celebrities no longer perform in Ukraine, and bookshops don’t stock books from the Russian Federation). But this isn’t quite the case: cultural links aren’t broken, they’re cracked. The worlds of cinema, music and publishing are still working. Cultural cooperation between Russia and Ukraine circa 2016 is reminiscent of the two countries’ transport links: there are no direct flights, but the trains still run, or you can get there via an indirect flight. Some “passengers” have decided to stay at home and some have paused their communications while waiting for “fair weather”. But other people aren’t foxed, and continue trying to show, tell and explain to the other side. In one of Kyiv’s chain bookstores, the promotion shelf is full of Ukrainian literature. Not long ago, it looked different: most of the new titles there were from Russia, either works by Russian authors or translations into Russian from other languages. There is no official ban on Russian literature, although Ukraine’s culture minister Vyacheslav Kyrylenko recently suggested that there should be. But while writers and publishers discuss the idea, booksellers are adapting: the staff at this shop tell me they are working with Ukrainian publishers in various cities to introduce their readers to new authors. Publishers confirm that, over the last few years, Ukrainian titles have become the main attraction. They fill the window displays and ground floor shelves, and readers have developed an appetite for new books from famous Ukrainian writers, not Russian ones as before. Among last year’s best sellers were books by musician Kuzma Scryabin, actor Ada Rogovtseva and millionaire businessman Garik Korogodsky. Stepurin’s colleague Aleksandr Krasovitsky, who runs the Folio publishing house in Kharkiv, doesn’t agree. He finds that books are not selling well; general demand has fallen in Ukraine. And this fall in Russian imports has more to do with economics than politics. There is, after all, no official ban, but imports have still noticeably declined: in 2013, before Maidan, books imported from Russia accounted for $13m worth of sales, while in 2015 sales had fallen to $3.5,. Krasovitsky himself has almost stopped supplying new books to Russia. He feels it is right to split the market. The only exception to this rule was a novel entitled Printouts of Overheard Fragments of Intimate Conversations and Perusals of Personal Correspondence, written by anti-Putin journalist Yelena Tregubova, author of the bestselling political exposé Tales of a Kremlin Digger, under the pseudonym Elena Swan. The truck carrying copies of the book into Russia was, however, stopped at the border for nine hours and then turned back. Some other publishers, including The Family Leisure Club mentioned above, do still operate in the Russian market. “Live” connections may have dwindled, but they have certainly not stopped: Ukrainian authors visit Moscow, and recently the Kyiv publishers Laurus held a launch for a collection of short stories by Oleg Sentsov, the Ukrainian film director who was imprisoned for treason in August 2015. It was not, of course, a large public affair, just a small gathering at the Ukrainian embassy. And attempts by Ukrainian writers to win larger audiences usually fail miserably: take the example of the play Maidan Diaries, whose author Natalya Vorozhbit and her associates spent the three months between November 2013 and February 2014 recording interviews with people on both sides of the Maidan conflict and then compiled a verbatim drama from them. The play was due to be presented at the Moscow International Open Book Festival in the summer of 2014, but the organisers wouldn’t allow the reading to take place. It was removed from the programme. As regards travel in the other direction, most literary visitors to Ukraine belong to that category of Russians who reject their government’s military-patriotic rhetoric and support the Ukrainians – the poets Lev Rubinshtein and Vera Polozkova; writers Liudmila Ulitskaya, Dmitry Bykov and Viktor Shenderovich, cartoonist Andrei Bilzho and journalist Igor Svinarenko. Polozkova regularly gives readings in Kyiv; Rubinshtein and Ulitskaya are invited to take part in the International Publishing Forum in Lviv. 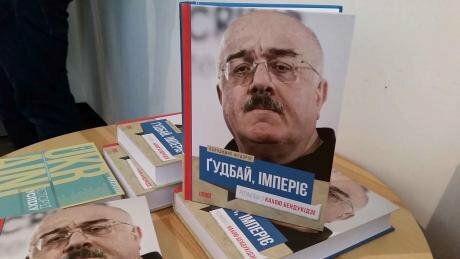 Russian opposition non–fiction writers also visit Ukraine: the former editor-in-chief of TVRain Mikhail Zygar, for example, had a launch for his book All the Kremlin’s Men in Kyiv, and satirist Mikhail Zhvanetsky is another frequent visitor. Next month, rock veteran Boris Grebenshchikov is bringing his band to Kharkiv for a concert, their second gig in Ukraine in six months – they performed in Kyiv in December. Russian music producer Mikhail Kosyrev confirms that this is the case. He tells me that everyone decides for themselves whether to come or not, but that many have put performances in Ukraine on “pause”, waiting, as they say, for “fair weather”. There’s also a clear dividing line by genre: the rockers and rappers still come, but Russian pop has disappeared from Ukraine’s music venues. Some musicians openly support the Kremlin’s actions; others may not make any political statements, are in sympathy with Ukraine and generally observe neutrality, but don’t want to risk their careers. So-called blacklists have also added to Ukrainian promoters’ troubles. Initially these were kept secret by the Ukrainian Security Service, and musicians would discover that they would be turned back at the border just a few days before they were due to play. This happened, for example, to popular singer Sergei Penkin, whose repertoire includes folk and art songs as well as popular western classics, and whose concert was already sold out. The concert, whose promoters had no idea that Penkin was on a blacklist, was cancelled at the last minute and all the ticket money returned. Eventually the Ministry of Culture published its blacklist of Russian artists, which contained 80 names. Musical traffic in the other direction — from Ukraine to Russia, has also shrunk from a broad river to a tiny stream. 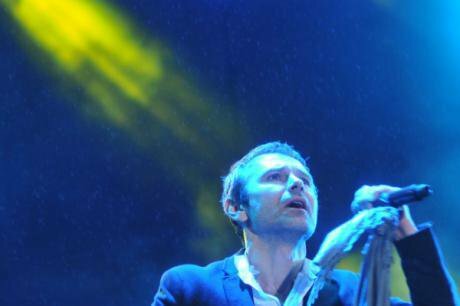 Okean Elzy, fronted by Sviatoslav Vakarchuk, is the best known Ukrainian rock band in Russia, but has not gigged there for a long time. There has been just one attempt to organise a concert since the beginning of the conflict. It was due to take place in St Petersburg’s Ice Palace in February 2014, but Vitaly Milonov, a United Russia member of the city’s Legislative Assembly and great enthusiast of bans in general, immediately wrote to the Culture Minister Vladimir Medinsky, demanding the concert be cancelled and Vakarchuk’s name put on a blacklist. The concert was indeed cancelled, but the musician has not become an official persona non grata — he has just refused to perform in Russia. Other Ukrainian artists, such as pop singer Ivan Dorn, the hip hop and reggae duo 5’Nizza, the eclectic Valentin Strykalo band and rock band Bahroma still tour in Russia, as does the fusion funk-reggae group SunSay. Its founder and front man Andrij Zaporożec almost became Ukraine’s 2016 Eurovision entry, but was pipped at the post by the Crimean Tatar singer Jamal. There might have been a political factor here: Sunsay has been accused of supporting the ‘Russian World’ concept by performing in Russia and Crimea. Some Ukrainian musicians are in fact much more up front, not to say ostentatious, about their support for the Kremlin. The singers Ani Lorak and Thaisia Povaly travelled to Russia on 22 February, to take part in a concert celebrating Fatherland Defender’s Day. There are rather fewer reasons for bans on films, as very few Russian films are still being shown in Ukrainian cinemas, and very few Ukrainian films were ever shown in Russia. Ukrainians have lost interest in Russian films, and audiences are much smaller than before, across all genres. According to Denis Ivanov, head of the distribution company Arthouse Trafic, this is even affecting animated films: these used to be real blockbusters, but the latest episode in the “Three Heroes” family-oriented comedy series, which came out at the beginning of last year, didn’t make it into the top ten grossing films in Ukraine (admittedly it didn’t in Russia either). Some cinemas have imposed a blanket ban on Russian films, although the Planet Cinema chain has made an exception for the comedy Election Day 2, which has just gone on general release. “Perhaps they did this because it’s been made by Kvartet-I,” says Roman Martynenko, head of the Multi Media Distribution company, referring to the indie Moscow theatre company set up by four theatre graduates in 1993 which has since also gone into film production. The comedy The Eight Best Dates, starring Ukrainian actor Volodymyr Zelenskiy, might have a tougher time hitting the big screens. It has just been released in Russia, but State Duma members have already called for a ban, and for Zelenskiy to be blacklisted as a person “who supports the punitive military operation in the Donbas territory”. But again, as with rock musician Vakarchuk, no official ban has been imposed. But Ukraine’s problems in the film market didn’t start with the conflict — they already existed before. According to Martynenko, in terms of cinema, Ukraine has always been quite dependent on its larger neighbour. And Ukraine’s bureaucrats are doing nothing to help its cinema industry cast off this dependence: on the contrary, they are strangling this barely viable sector with additional taxation. This dependence on Russia can sometimes lead to absurd situations. Last year, for example, Ukrainian distributors bought rights to show Swedish director Daniel Espinosa’s thriller Child 44, based on the investigation of the crimes of Soviet serial killer Andrei Chikatilo, through a Russian company, Central Partnership. But the film was pulled on the eve of its premier in Moscow for allegedly distorting Soviet history, and the distribution ban affected not just Russia, but Ukraine as well. Ukrainian distributors obviously feel the need to free themselves from this dependence, and the sooner the better, but current government policy in their own country does nothing to help them. TV serials are also affected by this situation. Most Russian serials have been banned by Ukrainian television, but it’s not easy to replace this massive chunk of schedule filler with local productions. A lot of programmes are now in production, but budget constraints are affecting their quality. One example of auteur cinema, Myroslav Slaboshpytskiy’s The Tribe has been shown in Russia both in cinemas and on TV, but it is an exception. The Tribe has been recognised as a major event in art cinema — a film of not just Ukrainian, but global significance. The artistic community is an exception to this complex story of cultural relations. It has been shown to be the one that is most monolithic, principled and independent of purely commercial interests. Progressive Ukrainian artists effectively closed themselves off from Russia after its actions in Crimea and Donbas. And those of their Russian colleagues who also deplored their government’s policies had an added stimulus to go to Ukraine and devote their work to the events taking place there. Konstantin Doroshenko, a contemporary art curator and one of Ukraine’s most influential art critics, tells me how the so-called referendum in Crimea took place as colleagues in St Petersburg were preparing for the 10th European Manifesta Biennale at the Hermitage. When Konstantin and his colleagues heard about the referendum, they refused to take part in the Biennale. An exhibition of work by the left wing Ukrainian artist David Chichkan was also planned to open at the Lenin house-museum in Razliv, near St Petersburg. The opening was cancelled. 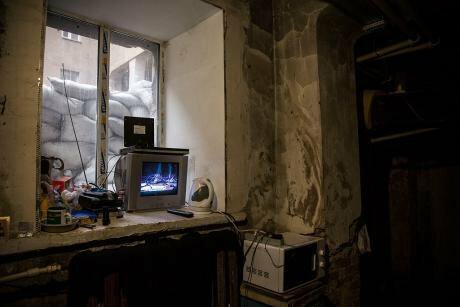 Later Nikita Kadan, one of Ukraine’s most prominent contemporary artists, and his REP (Revolutionary Experimental Place) group, founded at the time of the Orange Revolution of 2004, dropped plans to hold an exhibition in Moscow’s Vinzavod Modern Art Centre. Many European artists followed their example at the time. Ukrainian performance artists do nonetheless still go to Moscow — not to display their work to the public, but to use their art to express their political views.